The Audemars Piguet Royal Oak Selfwinding is a true classic. Its octagonal porthole design and thin case make it a real eye-catcher. The precise automatic movements, such as the caliber 2121 and in-house movement 3120, give this collection its name. 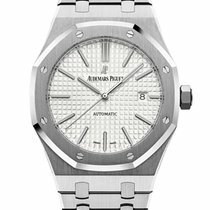 The Royal Oak has been the flagship Audemars Piguet model since its introduction in 1972. Since then, the Le Brassus-based Swiss manufacturer has released this timepiece in numerous iterations. Most Royal Oaks are selfwinding models, meaning they wind themselves automatically. Such models are easy to spot thanks to the "Automatic" inscription on the dial. You are sure to find what you're looking for in this collection, be it a watch with two hands, three hands, a chronograph, a perpetual calendar, a moon phase display, or a minute repeater. In-house calibers tick away inside a majority of the Royal Oak Selfwinding models. However, some still feature the legendary caliber 2121, which also appeared in the original Royal Oak. This movement was developed by Jaeger-LeCoultre in the 1960s and remains one of the flattest automatic movements with a date function, measuring in at 3.05 mm. 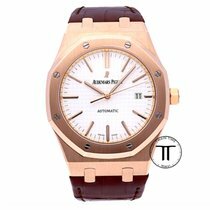 Today, Audemars Piguet is the only manufacturer still using this caliber, though it also used to power watches from Patek Philippe and Vacheron Constantin. When purchasing an automatic Royal Oak, your choices aren't just limited to different movements and complications. You can pick your preferred case material from either stainless steel or yellow, rose, or white gold. With cases ranging from 36 to 41 mm in diameter, the Royal Oak Selfwinding is a great choice for both men and women. How much does a Royal Oak Selfwinding cost? Yet another decision you will have to make is whether you prefer a retro model or a more modern one. If you're feeling something with a vintage look, you may enjoy models with the reference number 5402. The very first Royal Oak had the same reference number. At the time, its 39-mm was considered large, hence the nickname "Jumbo." The caliber 2121 ticks away inside this timepiece and provides it with its two hands and a date display at 3 o'clock. There is no second hand, nor is there a stop-seconds mechanism or quickset function. Set aside around 43,100 USD for a never-worn Royal Oak 5402ST in stainless steel. Those in good condition sell for around 29,000 USD. Prices for the yellow gold 5402BA model climb to about 49,000 USD new and 38,500 USD pre-owned. The 5402SA pairs a stainless steel case and bracelet with a gold bezel and is the most affordable of the lot. 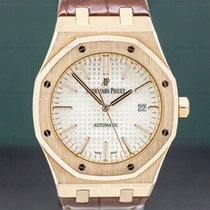 Plan to spend around 21,000 USD on one of these timepieces. The 5402 was replaced by the nearly identical 15202, which remains in the Audemars Piguet catalog to this day. It also features the caliber 2121, a 39-mm case, and is known by the nickname "Jumbo." However, unlike its older sister, its date display matches the color of the dial. The 15202 also includes a sapphire glass case back that offers a great view of the movement. Depending on its condition, expect prices between 23,300 and 29,200 USD for a stainless steel piece. Examples with a gold case can easily cost up to 46,600 USD. At 36 mm, the ref. 14790 is largely geared toward women. Audemars Piguet also went with a caliber based on a Jaeger-Lecoultre movement for this model – namely, the JLC 889, which forms the foundation of the AP calibers 2225 and 2325. This movement is as thin as the 2121 but has a smaller diameter and includes a second hand and a stop-seconds mechanism. In stainless steel, this watch goes for between 11,100 and 14,000 USD. Prices for the bicolor version with a stainless steel case and yellow gold bezel sit around 15,200 USD. Audemars Piguet developed the in-house movement 3120 at the turn of the millennium. It has a modular construction, meaning it is easy to add modules with additional complications to it. This movement made its first appearance in the Royal Oak family inside the 39-mm ref. 15300. Since it is slightly taller than the caliber 2121, watches featuring this movement are somewhat thicker. However, this also lends the watch its central second hand, stop-seconds mechanism, and jumping date display . A stainless steel Royal Oak 15300ST in good condition costs about 19,800 USD, while a never-worn example costs about 1,200 USD more. If you prefer the gold 15300OR model, plan on spending around 21,000 USD. In 2012, the significantly larger ref. 15400 replaced the ref. 15300. The biggest difference between it and its predecessor is its larger, 41-mm case and screw-down crown that is better at keeping out water. Very little changed in terms of technology, as the caliber 3120 also ticks away inside this timepiece. New models in stainless steel require an investment of around 21,000 USD. Used models in good condition are only slightly less expensive at 19,800 USD. You'll need to dig a bit deeper in your pockets for the version with a gold case: Prices for this model sit between 38,500 and 43,100 USD. 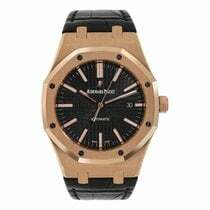 Audemars Piguet released the ref. 15450 at the same time as the ref. 15400. While it features the same technology, it has a much smaller, 37-mm case. Prices range from 17,500 USD for a steel model to 35,000 USD for the gold version. There are also plenty of complicated Royal Oak Selfwinding models for those who prefer something a bit more interesting. The Royal Oak Grande Complication is particularly elaborate. It features a split-seconds chronograph, perpetual calendar, moon phase display, and a minute repeater. To fit the in-house caliber 2885 and all of its functions, the white-gold case boasts an impressive 44-mm diameter. Pre-owned pieces demand a good 346,000 USD, while those in mint-condition often cost about 670,000 USD. The Royal Oak Perpetual Calendar is a bargain in comparison. This 41-mm timepiece includes a perpetual calendar, as its name suggests, and is available in stainless steel or rose gold. Depending on the material and condition, plan to spend between 57,700 and 80,800 USD. The Royal Oak Chronograph is even more affordable. 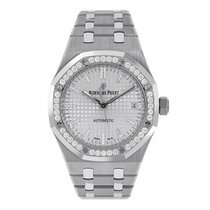 You can purchase a pre-2012 39-mm stainless steel model in mint condition for as little as 13,900 USD. Its successor has a 41-mm stainless steel case and sells for around 25,400 USD. The 41-mm Royal Oak Chronograph also comes in rose or yellow gold. Prices for these models sit around 49,700 USD.